My latest novel, Gunslinger, P.I. (awesome cover by Cody Sims pictured to the left) will release July 11 exclusively for Kindle, and I’ve decided to try an experiment and release it for free for the first three days. So from July 11-13, Gunslinger, P.I. will be available to download for free on Amazon. His name is Garret Gallagher, but don’t call him that or he’ll shoot you in a particularly uncomfortable appendage. Every thug and criminal in Scud City knows him as Gunslinger. They say he traveled through time from the Old West. They say he drives a talking car. They say for five grand he can solve any murder in forty-eight hours. As it happens, everything they say is true. Gunslinger, P.I. lays out five days in Gunslinger’s life. Hired by an allegedly Irish gangster to investigate a particularly suspicious murder, Gunslinger navigates a rocky relationship with his talking car girlfriend, lusts over a foul-mouthed femme fatale, butts heads with a twenty-first century cowboy wannabe, plays Russian Roulette with an idiot, and seeks out revenge on anyone who lies to him – which happens to be pretty much everybody. A darkly comic murder mystery at its heart, Gunslinger, P.I. blends Western and noir with touches of fantasy, science fiction, and romance for a one-of-a-kind, mile-a-minute ride at the hands of a crass, madman antihero with no regard for the reader’s comfort level. 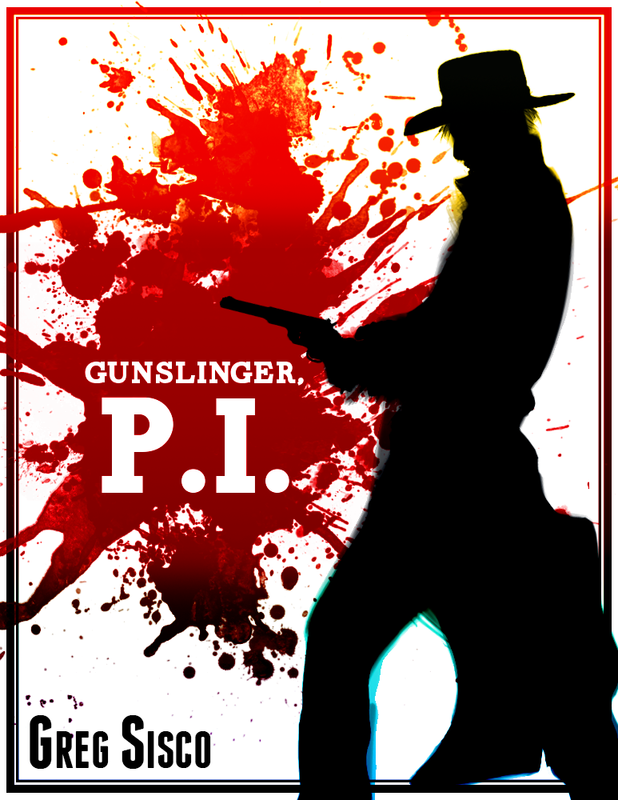 Gunslinger, P.I. will be released July 11, and will be free from then until July 13. To make sure you don’t miss it, ‘like’ my Facebook page. This entry was posted in Writing and tagged books, comedy, crime, dark comedy, ebook, fiction, free, Greg Sisco, Gunslinger P.I., indie, Kindle, novel, science fiction, western. Bookmark the permalink.